Ryan Chitwood, a third-year radiologic sciences major, positions the X-ray machine above the mummy named Umi as students and faculty look on. 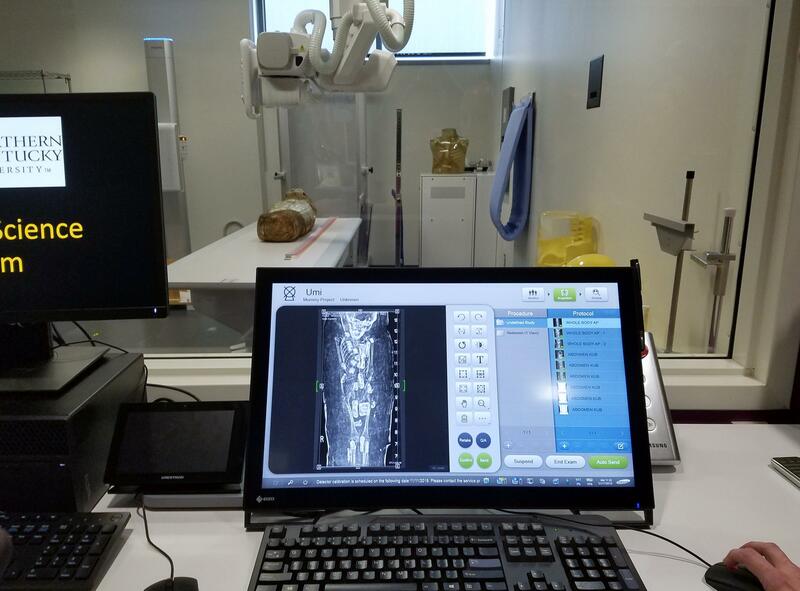 It's been nine years since the museum center's last scans of the mummified remains. Technological improvements mean new images taken Thursday by NKU students may be more detailed. Better images could help museum curators learn more about how Umi died, says Bob Genheimer, curator of archeology. "The first time we looked at it, there was nothing showing. Often times, skeletally, you can't tell what occurred. We didn't see any clear trauma." An X-ray shows the skeletal remains of a young boy. It also reveals amulets placed along his body to represent his various organs in the afterlife. Even if the new images don't give any further clues, he's hoping to learn a little more about what's underneath the linen wrappings. "We also want to reproduce the body again through 3-D printing, and a series of amulets that are with the body, as well." Based on the eruption of his teeth along the jaw, curators know Umi was between 3 and 5 years old when he died. Researchers determined he was male based on the markings on the wrappings. "We don't know his name," Genheimer explains. "We gave him the name Umi, which in North African means 'life,' because the afterlife was important to these people." Genheimer says Umi would not have been royalty. It was commonplace to mummify deceased individuals and animals 1,900 years ago. Sarah Kramer, a third-year radiologic sciences major, guides Umi into the CT scanner under the guidance of Assistant Professor Jason Applegate. Several dozen third-year NKU students clad in black surgical scrubs crowd around the various medical devices and computer screens. They take turns pressing buttons, moving X-ray panels and positioning the scanners. 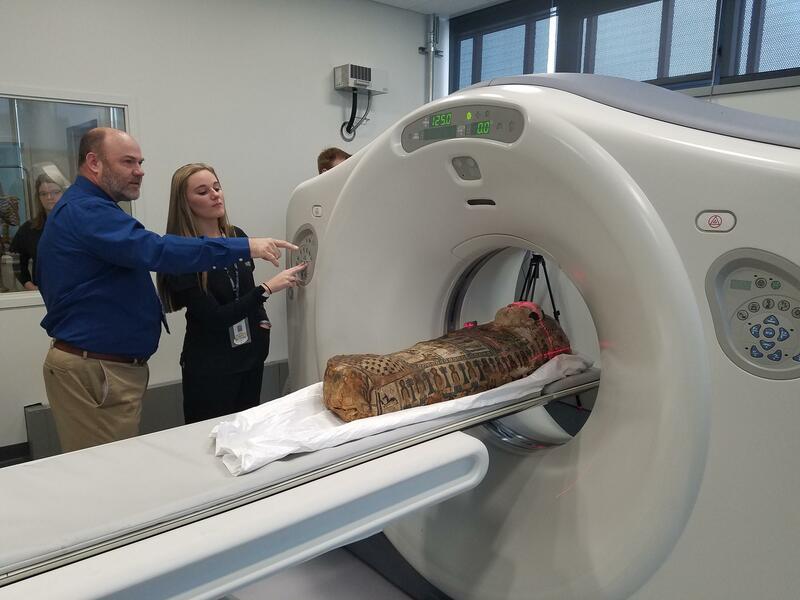 Assistant Professor of Radiologic Sciences Jason Applegate calls scanning the mummy a "once in a lifetime opportunity for the students," only made possible because "NKU is one of just a few undergraduate universities to have a CT scanner." 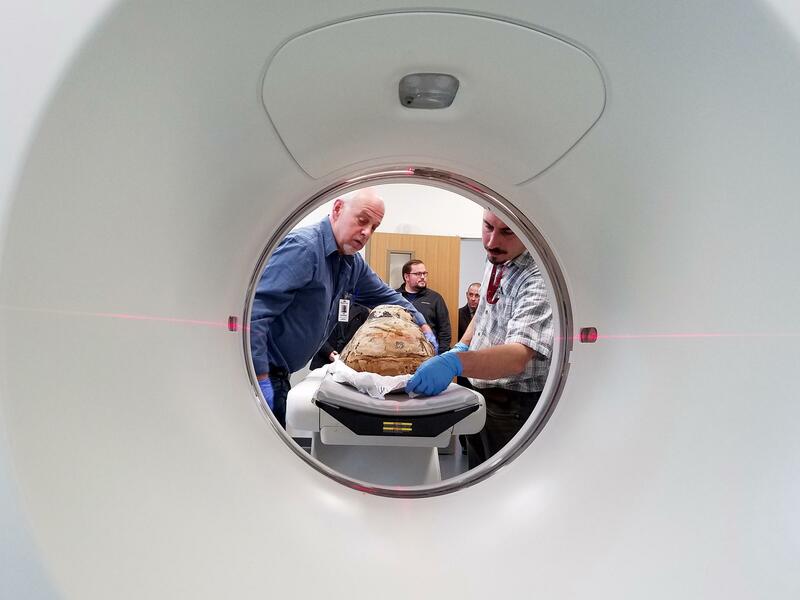 Cincinnati Museum Center curators Bob Genheimer (left) and Tyler Swinney carefully place the mummy onto the CT scanner before students take turns making scans. Umi goes back on exhibit at the Cincinnati Museum Center March 22. Genheimer says he'd like to have some of the results ready for display then, too. Umi will be on exhibit through the end of 2019.